It's Tablescape Thursday, one of my favorite days. Thanks to Susan @ Between Naps On The Porch for hosting this great event. Be sure to visit her and see her beautiful tablescapes she always creates and all the others who are participating. Great inspiration and eye candy abound from all over blogland. It is very warm here and we certainly can't eat outside, so I thought I would bring a little outside in. I found these two lovely metal lanterns at Home Goods on the clearance aisle and thought they would be great to use on the patio and in the house. On a recent trip to the GW I found this pretty pink and white tablecloth and pink napkins, so the color scheme started to unfold. A few pink and white roses in a small brandy sniffer also brought the garden inside. 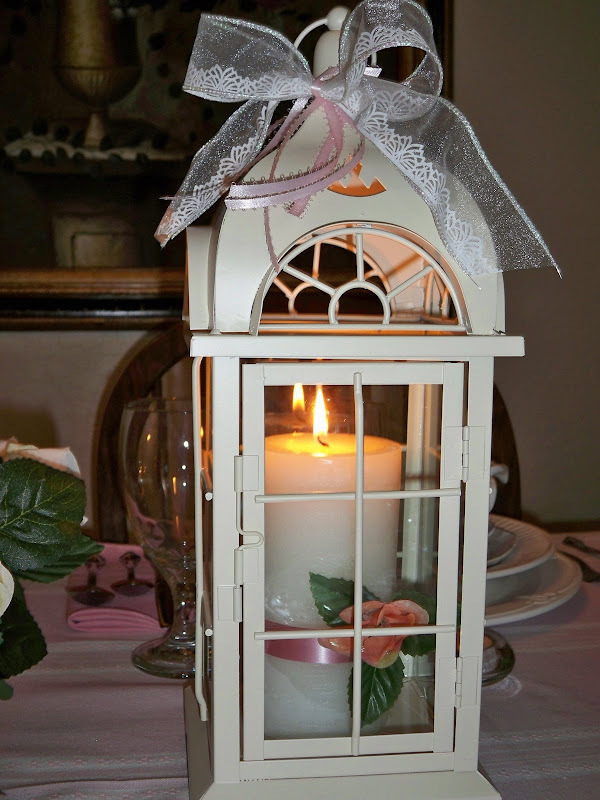 I placed a ribbon and a small rose bud around each candle inside the lanterns and tied a pink and white bow to the top. I thought this made them soft and pretty. 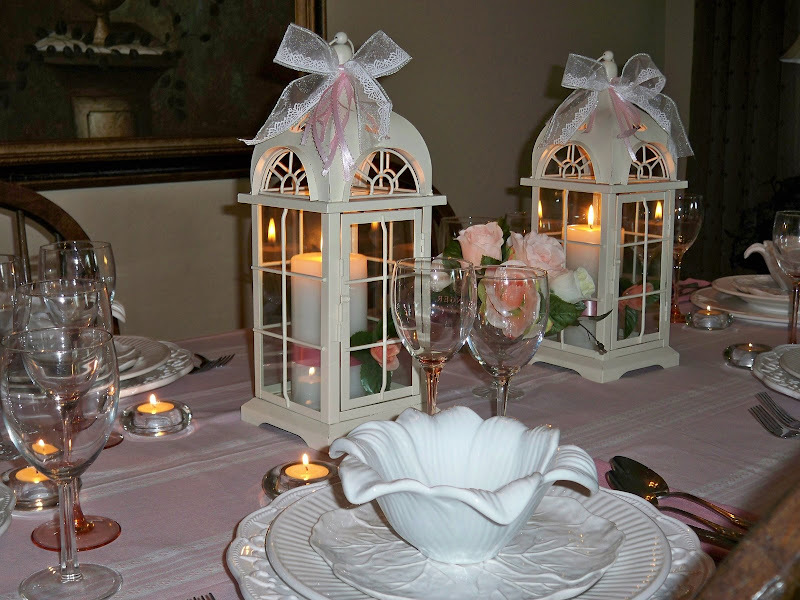 The small round glass tealight holders were found at the Dollar Tree and along with the pillars in the lanterns add a soft glow to the table. I love the detail on the lanterns. The lovely domed top and all the pretty cutouts on the sides. For the tablesetting, I am using a pink wine glass and a clear goblet. The charger is Lace by Kennex, the plate is the famous Big Lots Gibson, the cabbage salad plate is Mikasa Spring Countryside and the flower bowl is Pier One imports. I love these little lanterns and think I will use them often. Thanks for stopping by, I always appreciate your visits and your comments. P.S. Don't forget Friday (tomorrow) is the "Cloche Party". I will have Mr. Linky up before 8pm eastern time tonight (Thursday). Be sure to add your name so everyone can find you and see your beautiful containers and how you've decorated them and where you use them. So pretty and elegant! I love the lanterns. I saw these a HG and now I am wishing I had purchased them! :-) You did a lovely job! Thanks! My friend you are just getting better and better at this. But, I think you are quickly discovering the secret to tablescaping - lots of dishes and stemware and linens, etc. Lucky you to have such a fab GW close by. This might be one of your best yet. I love the soft, subtleness of this table. The pink cloth and the white on white dishes. Perfect! What great finds those lanterns were. I am so jealous! Hi Marty, your table is lovely. I love, love, love the white dishes and the mixture of patterns. The pink tablecloth is so soft and the lanterns are just perfect. It is all so lovely. Getting all my pictures ready for Friday....how fun. So pretty in pink and white. I love your mixture of textures with the different white plates. Those lanterns will come in handy for lots of occasions, I'm sure! Wow, Marty! I love your table. I love the texture of the different designs of the white plates. I love the lanterns holding the candles. Everything looks wonderful and feminine. What a lovely table. I really like those lanterns! So soft and pretty. I'm looking forward to the Cloche Party! Marty this is truly eleagant and beautiful! 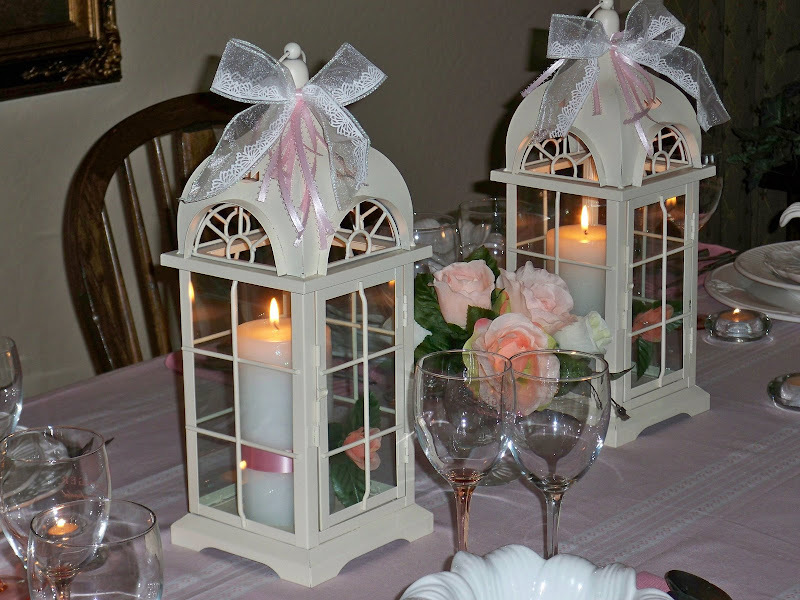 Your lanterns are spectacular and look great with the soft ribbon and pink roses. You can use them in so many ways. Thanks for your kind words on my table and "cloche". I appreciate your kindness. You're the best! I know your cloche party will be a wonderful success. Your table looks wonderful. Love the lanterns and white on white layering of the dishes. Oh, Marty! How beautiful! I love those lanterns and how you've dressed them up. 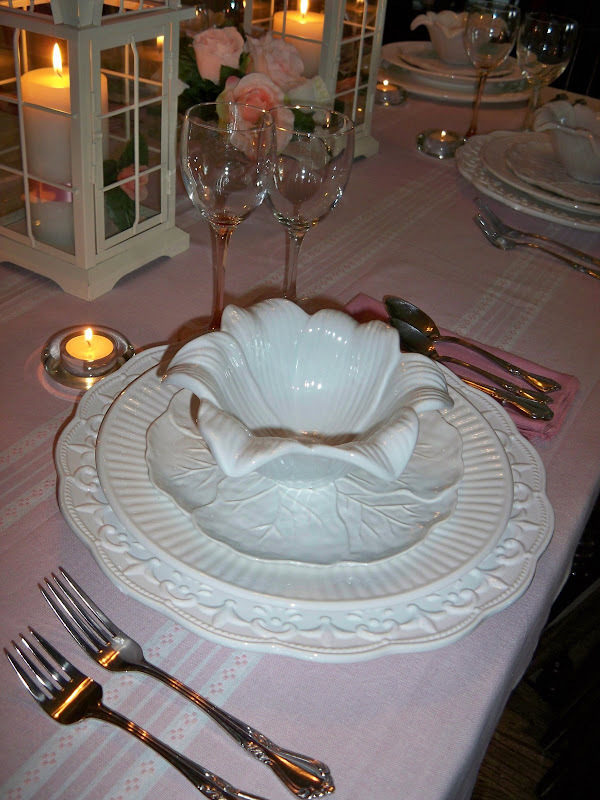 Your pretty white dishes look so elegant on your newly found pink tablecloth! Pink and white - so lovely! I can't wait for your cloche party! This is so pretty, Marty! I love it! This is sooo pretty Marty! 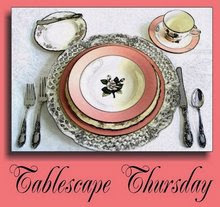 I love the soft pink and white color scheme...and those cabbage leaf dishes by Mikasa...oooohhh! I love it when I find things I can use inside and out! Those lanterns are fabulous! I love it all, Marty! Such an elegant, beautiful, soothing table you've set. Those candle lanterns are gorgeous. The flower bowls are very pretty also. This is just beautiful. I'm always partial to white on white . . . and those lanterns just set it off perfectly. Makes me afraid to make the first big step into tablescape land!!!! Those lanterns are fabulous and love all the white. Very exquisite looking! MARTY! How beautiful!! The lanterns are beautiful! I think you will use those a lot!! I love the white on white and the layers of course! Well done! Happy TT! 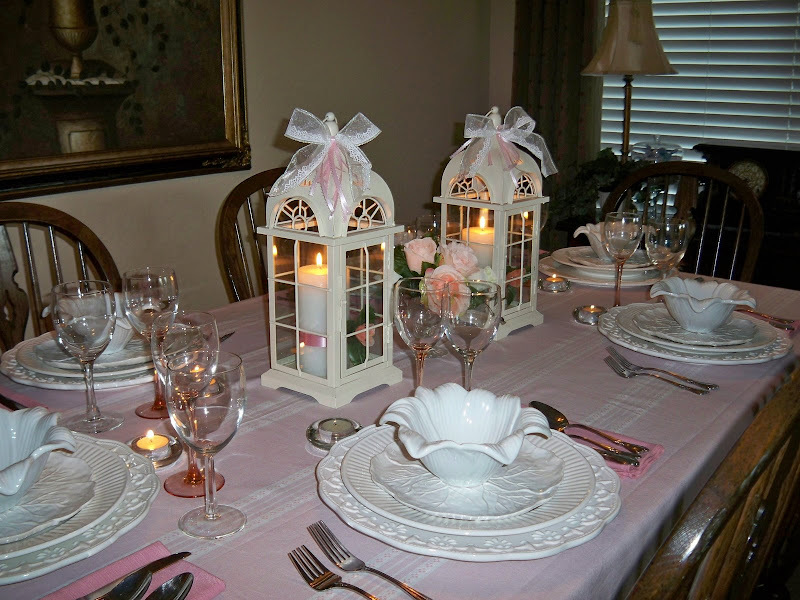 I love the sereneness of your tablescape -- the white andpink -- great job! marty, what a lovely tablescape - so feminine and dainty. it would be a perfect table for a bridal shower or other special girls-only event. so pretty! this is my very first tablescape thursday and i am completely enjoying it! I am the biggest fan of white dishware...it has to be one of the most under~rated design tools! Wow, you have certainly made a grand statement! I love the pretty pink tables. I love the dollar store. Your lanterns are gorgeous. What a lovely table! those lanterns are wonderful! Looking forward to the cloche party- looks like there will be a great turnout but all the talk in blogland about it!! LOVE those lanterns... they are SO pretty! And the bowls!! Perfect! Marty, those lanterns and the overall color scheme is so pretty... I want to sit down at that table and just take them all in! Beautifully done! I used to think that white dishes were boring. Then, I found this place. Now, white tablescapes are some of my favorite. The pale pink adds a touch of elegance. Always enjoy seeing what is created. Having tea today. Hope you'll drop by for a spell and unwind. I love the lanterns!!! And all the white dishes. Fabulous tablescape. 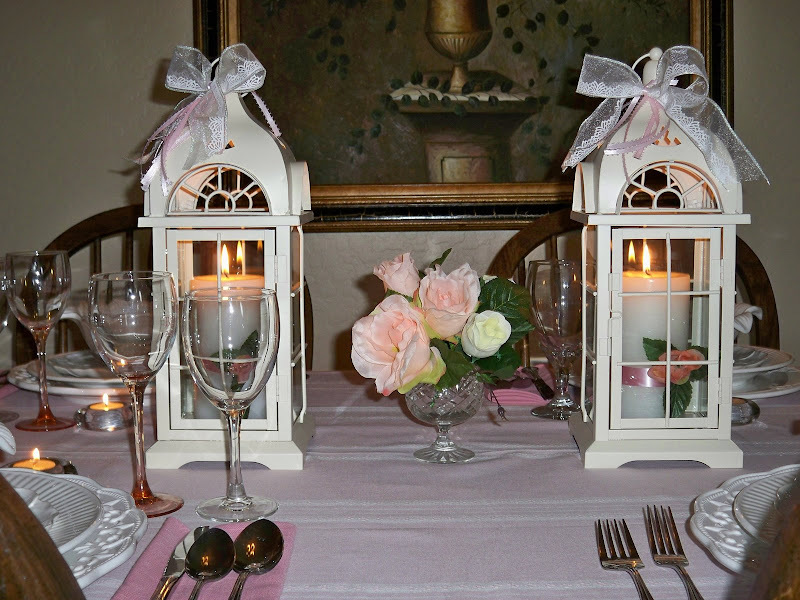 I love how you added the rose buds & ribbon to the pillar candles in the lanterns. Eveything looks so gorgeous, twinkling, magical in a sense. I love the combination of the two beautiful laterns with the tealights....it is the tea lights that bring such sparkle up toward the laterns and dances off the stemware. Oh how lovely! such soft and pretty colors, and such a wonderful combination of dishes! A truly beautiful table! Your table this week looks like it in another room in another house...it is exquisite ! I love all your setting but, this one is so very very pretty ! I love those lanterns too....now I want some - you know what happened last time with your dishes..(oh no I am in trouble !) Now I got to go look again at your lovely pictures !!!! Very Pretty - really like those lanterns. Wish we had a Home Goods here. Marty, beautiful tablescape...very elegant. The lanterns are perfect. Love your layering of white dishes. The flower bowls from Pier 1 are wonderful. Thanks for sharing. Beautiful! I'm loving all the white with the pink touches. Just girly and sweet, love it. I just went over to Melissa's blog and realized I forgot about the cloche party. Phew, I still have time to be included. I'm off to take some pics! Girl this is sooooo pretty...I can't begin to tell you how much I love those creamy white lanterns!!!!! Everything is just so pretty to the eye Marty....great tablescape sweetie! Oh Marty! That pink is sooo sweet! I think its just beautiful. I wold love to be sitting there surrounded in all that sparkly pink prettiness! 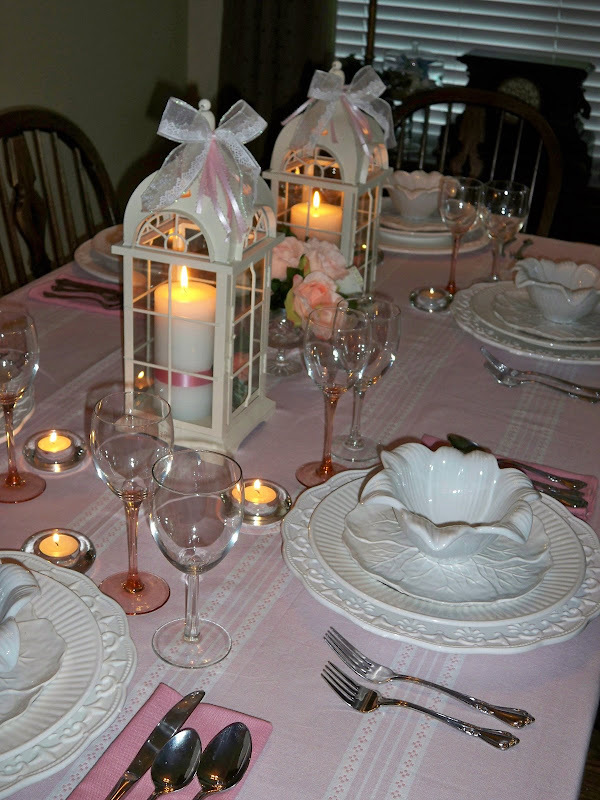 How beautiful your table is...I also love all the dishes, including the pink stemmed glassware. You must have huge cupboards to be able to store all these things. Oh what a pretty sweet table. The colors are so soft and I love your assortment of dishes. Just perfect. This is so pretty. I love those Big Lots white plates. I've got to get off this cane and get over there soon! The detail on the other plates and bowl are beautiful. This is very classy. I already have my pics ready to go for tomorrow! Marty, this is SO DELIGHTFUL! I'm so glad I came by to see this today, because it's become inspiration for me for a project I have coming up. LOVE LOVE LOVE those lanterns on the table, and it's all so beautiful with just the white and the soft blush tones. GORGEOUS! Great job! I adore all the white on white. It is so soothing to me and really invites me to relax and enjoy life. This tablescape is so sweet with all the whites and soft pink pastels. I especially love the lanterns, and the flower bowls! This is so soft and pretty Marty. The flower bowls and the cabbage plates just look like they were meant for each other. I love these this setting. Well done. I am so glad you enjoyed the eye candy from Nell Hill's. I would love to go there soon. I think JoAnn & I will hope to make that trip in the fall. I think I will post again some bedroom photos from there on Pink Saturday. What fun we have in blogland. I love your tablescape. I am with you on it is too hot to eat outside. We girls down in the hot country have to dream about that this time of year. But, your table did look very garden like. LOVE the bowls from Pier One! Just like a flower. Thanks for sharing & coming by. Marty I just saw your comment at Dianes. I've had the same issue with my posts lately. I publish them and they don't show up on blogger for hours. I'll link up when your post shows up. It will be a big success! Just read your sweet note...got to thinking that this is your first time to use Mr. Linky right? Just to let you know...it will not show up in your post until you publish the post. Not sure why it's like that but didn't want you to be waiting for it...to see it...in your post. It will show up in the blog post after you publish it, my friend! Very pretty table. I love the lanterns. I am going to have to keep an eye out for some of those. Thank you for hosting this fun party ! I love your bird cloche. I can't believe someone wouldn't want it. The cloche with the statue underneath is beautiful and unusual. Oooh, I love your tablescapes. They are gorgeous. I like the fact that all your pictures are so large. You can see them so much better. Your table is just stunning. I love the lanterns, too. This would be a perfect post for the LET THERE BE WHITE, a tablescaping affair using whites.....June 23 at CUISINE KATHLEEN. I have her button on my sidebar if you want to click and find all the info..